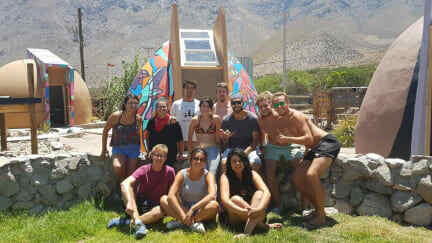 Hostel Cosmo Elqui Valley is a place where you can disconnect from the daily routine and get in touch with the incredible landscape and special energy of the Elqui Valley. We want you to experience the most incredible starry nights under the clearest skies joined by our friendly and carrying staff that will make you feel at home. In our hostel you will find different common areas and places to relax and enjoy like, swimming pool, common kitchen, picnic area, hammocks and a bon fireplace. Located in Rivadavia, a small town right in the middle of the Elqui Valley, between Vicuña and Pisco Elqui. We are located near to some of the finest attractions of the area such as Tramo Rivadavia a Diaguitas, meanwhile the city of Vicuna is one hour away by car. We have different accommodation options to suit the needs and desires of different types of guests and travellers. We have dorms with several capacities as well as private accommodation options ideal for friends. 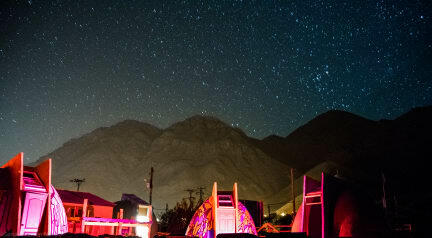 We will have an atmosphere of dis-connection and chilling, but with the same good vibes and quality of our already known Hostel of La Serena, mixed with the camping and the pool area, to be able to enjoy the spectacular view of the stars. Our new experience will include all the mystic and magic that our travelers are looking for. The check out must be at 11.00. Nevertheless, the customers can be within the facilities up to 18.00 with no extra cost. Taxes not included - 19.00%. The foreign travellers who have been in Chile for less than three months will be exempted from paying the tax rate.